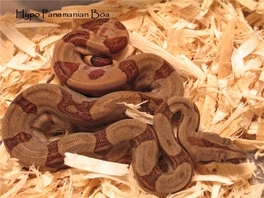 In 2008 I picked up a beautiful pair of Mainland Belize Boas. 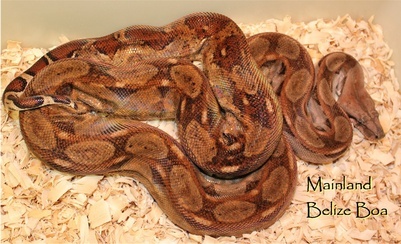 These Boas were easy to breed & have done so twice now ( 2012 & 2013 ).These are beautiful snakes & very light colored. The parents came from Dr. Scott Boback & he caught the grandparent in a Junk yard in Belize ( it was documented in a 2001 Nat Geo snake special he did - he also featured the Crawl Cay Boas in that episode). A picture of the Mom is below & a picture of her offspring. 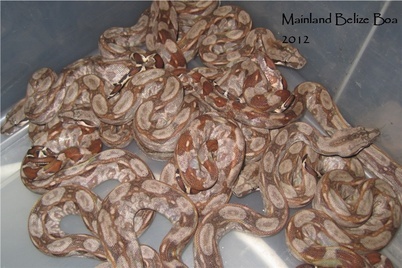 These too are very small boas & bred & gave birth in a 28 quart rubbermaid. 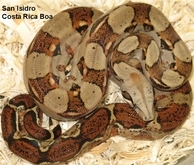 True Costa Rican Boas with provenance to Costa Rica are quite rare in collections & I was fortunate enough to obtain two nice groups from two seperater shipments in 2005. 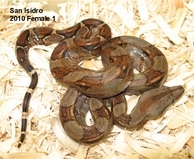 One group are captive born & bred Costa Rican boas from the northwest corner of the Country near Liberia and come from Zoo stock. The Other is a group purchased again from Zoo stock that was originally collected in San Isidro El General in the South West of Costa Rica. These exhibit some beautiful orange & gray/ brown undertones. Some even look hypomelanistic with alot of red in the tails. 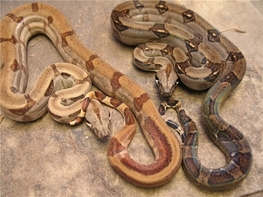 They are a small race of boa & breed at under 5 feet. 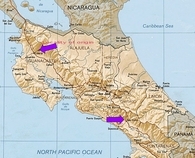 A unique locality of Boa that deserve more attention. A few litters are born here each year & they keep getting better & better each time. 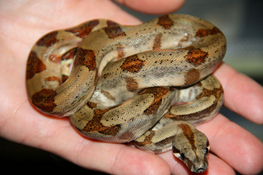 Panama has shipped Boas to the U.S. only a handfull of times in the past 10 years. In 2005 I was fortunate enough to get a few boas from a shipment sent to Florida. 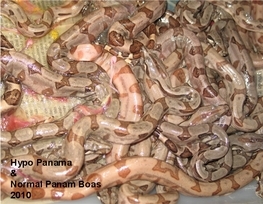 This shipment had both Hypomelanistic Panamanians & normal appearing Panamanian Boa c. imperator. 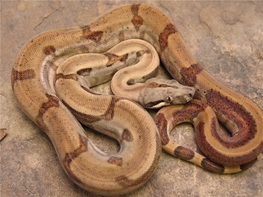 There was no indication as to the locality data of these Boas but the normal boas are quite similar to the Costa Rican Boas. The Hypos from this bloodline are outstanding localty boas with alot of orange & red while the normals have some beautifull colors too. These boas differ greatly from the Pearl Island boas in that the scale counts are different & the overall look - body shape / head shape & colors are way different from their Island cousins. They also are very small & stay that way as my 7 year old breeders are around 4 - 5 feet in length. They have good sized litters of small babies & are breed easily in my care. A great Boa if you want something small & compact. Lastly - the Hypo gene in Panama Boas works in the same manner as all of the other Hypo Boa constrictors in that it is Incomplete or Co dominant.